I've uploaded a Rise training to the LMS with the option "track using course completion". Upon completion of the training, the course's status is Passed...but I would like it to be "Completed". Is that possible to manage in Rise? I could see how having those options as a part of "Track using course completion" would be helpful too, so I'll pass this along to our team as a feature idea. That would be great, Alyssa, because this behaviour is "confusing" the LMS! I had this problem too and (until the option to select the desired reporting pairing exists in Rise for course completion courses) there is a fairly simple solution to change 'passed' to 'completed'. Thank you so much Stuart. Hoping they'll add an option soon, but in the meantime that is brilliant and will keep me out of trouble! I really appreciate you taking the time to help out. would you recommend to use "complete/incomplete" or "complete/failed" for totara(moodle)? Thanks for chiming in! Are you having some trouble with a Rise course sending completion data to Moodle? While I don't have specific experience with that LMS, I know there are quite a few Moodle-users in this community. If you can let us know a bit more about the trouble you're having, we can point you in the right direction! I wondered if anyone knows how to change the status reporting back to the LMS for xAPI (TinCan). I use Stuart's fix above all the time for SCORM, but the index file for xAPI (TinCan) doesn't have the same code and I'm not sure if the same thing is possible? Hoping it is. Glad I found this - just having the same issue when releasing our first RISE course. Have found and changed that line of code and sent the content off for upload - fingers crossed - cheers Stuart. 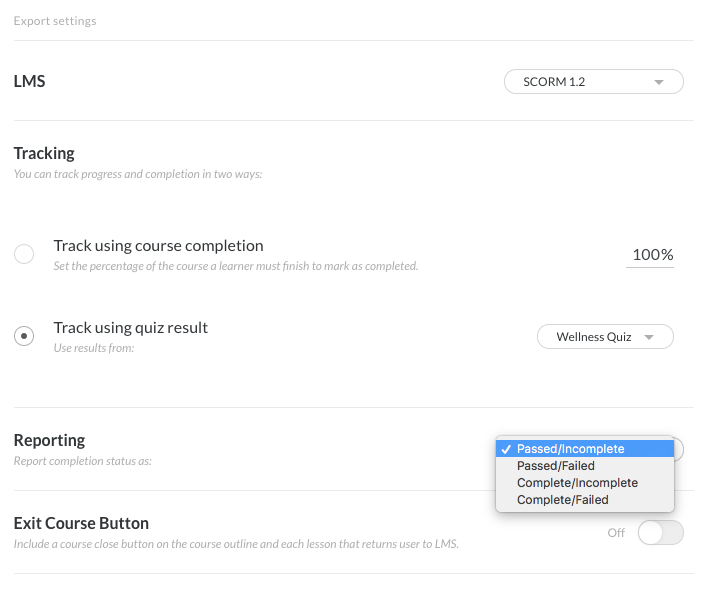 +1 for adding those options as part of "track using course completion" please! Great tip. I find though when I make the edit to the Index file and then re-zip the package I get unexpected results from my LMS. Sometimes the course just doesn't launch at all. Any ideas? Make sure that you are re-zipping the contents of the folder and not the folder. Other than that then I can't think of another reason why you would have issues. I've done that. What happens is, once I re-zip and upload to the LMS, when the course is taken, only a very small portion of the module is considered complete. Because I have a locked survey below it, the user is not able to do the survey until I manually mark them as completing the main module. I figured it out. The Index.html file needs a lowercase completed. I was typing it in as Completed. Talk about how far we've come in the technology field. Excellent. Good spot. Yes - these values are case sensitive. For Blackboard LMS, Can you track a Rise course with the option 'track using course completion" 100% ie they have viewed all the blocks within the course. I have knowledge checks throughout the course, but these are for learning and are not graded. I have good news! We have fixed this issue with Rise and courses can now be reported to track using course completion. By the way Martika - is there anything different we need to do in selecting course completion when publishing to LMS? thanks so much for sorting this !!! I don't understand what the fix is. Is there something special I need to do in RISE so the LMS will recognize completion? I seem to be having the same issue others have talked about. When I complete the course I created in RISE, the Rise panel shows it as complete but the LMS does not. It eventually recognizes if when you close the course but we have trained our folks to look for the course to be complete in the LMS before they shut down. You are now able to select reporting options in the Export Course settings (see screenshot). It looks like you're having a separate issue. Maybe adding an Exit button (which is possible in the Export Settings as well) would be a good solution. "I had this problem too and (until the option to select the desired ..."